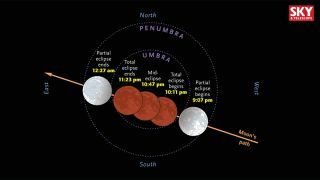 Events for the total lunar eclipse on the night of September 27–28, 2015. This version is labeled for Eastern Daylight Time (EDT). Because of the moon's slightly off-center path through Earth's umbra, the southern half of its disk should look slightly brighter during totality than the northern half. The full moon tonight (Sept. 27) will be an especially special lunar occasion. In addition to being a traditional "harvest moon," the moon will be at its closest point to Earth in its orbit, making it a so-called "supermoon." Plus, skywatchers people across North and South America, Europe and Africa will get to see a lunar eclipse, because the moon will pass into the Earth's shadow. You can watch the harvest moon lunar eclipse live in a webcast by the Slooh Community Observatory. You can also watch the total lunar eclipse on Space.com, courtesy of Slooh. The equinox occurs when the sun crosses the celestial equator. At that time, most points on the Earth have almost exactly even proportions of day and night — 12 hours each. Besides astronomical events, however, fall signals a time to reap the crops that have been grown all summer. That's why it is called a harvest moon. "Corn, pumpkins, squash, beans and wild rice — the chief Indian staples — are now ready for gathering," Space.com's skywatching columnist Joe Rao wrote in an article about the full moon names of 2015. The harvest moon is also sometimes called the "corn moon," too. "At the peak of the harvest, farmers can work into the night by the light of this moon," Rao added in a 2013 article about the moon names. "Usually the moon rises an average of 50 minutes later each night, but for the few nights around the Harvest Moon, the moon seems to rise at nearly the same time each night: just 25 to 30 minutes later across the U.S., and only 10 to 20 minutes later for much of Canada and Europe." Editor's Note: If you snap an amazing picture of the September 27 total lunar eclipse, you can send photos, comments and your name and location to managing editor Tariq Malik at spacephotos@space.com.